Take a journey along several of Northern Virginia's most beautiful nature trails with award-winning filmmaker and photographer, Victor Rook. 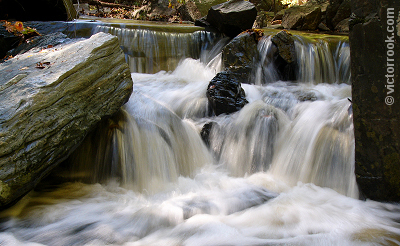 Prince William Forest Park, Manassas Battlefield Park, Ellanor C. Lawrence Park, Conway Robinson State Forest, Brentsville Nature Trail, and Bull Run-Occoquan Trail. Explore Pathways, Flora, Fauna, Water, Seasons and more with still images set to soothing music by award-winning composer, Kevin MacLeod. Includes a Nature Photography Tutorial. Widescreen DVD NTSC. Approx. 31 min. 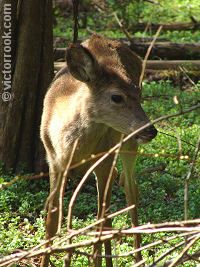 Left: A young deer looks for food in the early spring. 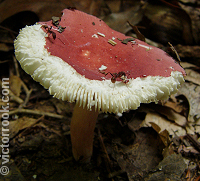 Above: Ants feast on one of the many colorful mushrooms along the trails. 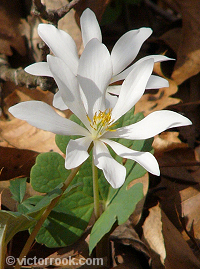 Flowers from the bloodroot. 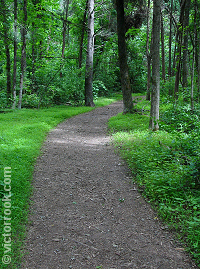 Pathways and trails abound. PLAY FUNGI: One of the many pieces from the DVD. Spectacular panoramas to intimate closeups. No matter where you're from, this DVD can be enjoyed by anyone who appreciates the extraordinary diversity of the natural world that surrounds us. Sit back, relax, and enjoy hundreds of wonderful images taken from over 50 hikes on your TV.